Sumedang is one of the regencies in West Java which is famous for its unique snack, namely Tofu Sumedang. Located 45 km from Bandung, Sumedang is surrounded by mountains and beautiful panoramic views. Although only accessible via the road, Sumedang has a stunning landscape that is worth visiting. Let’s see the top things to do in Sumedang Indonesia. Taman Buru Gunung Masigit Kareumbi (TBGMK) is a conservation forest that is developed as a natural tourism area. TBGMK offers the sensation of staying outdoors with wilderness scenery while enjoying the beauty of the natural surroundings. You can stay in a tree house or set up a tent on a camping ground. In addition you can ride bike around the forest or see the deer breeding. Although in the middle of the forest, TBGMK is equipped with toilets and electricity. Taman Buru Gunung Masigit Kareumbi is located in Leuwiliang Village, Tanjungwangi, Cicalengka. The admission is Rp 7,500 on weekdays and Rp 11,500 on weekend. The cost of renting a tree house starts from Rp 450,000. The cost of renting the camping ground is Rp 800,000 / night. Besides Sumedang, Bogor also has a great natural attractions. Spend time there, you will have lots of things to do in Bogor. Batu Dua Hill is a tourist area located on the slopes of Mount Lingga. From Batu Dua Hill you can see the breathtaking scenery of Sumedang. The management of Batu Dua Hill also provides paragliding tours for you who want to see the beauty of Sumedang from the air. Here you can fly in the air for up to three hours. Batu Dua Hill is located in Cimarga Village, Cisitu. It’s about 25 km from downtown Sumedang. It’s free entry. Anyway, if you have the opportunity to come to Island of Gods alone, then paragliding is definitely one of the things to do in Bali for solo travelers. Mount Tampomas, which is in the northern region of Sumedang Regency, has a height of 1,684 above sea level. 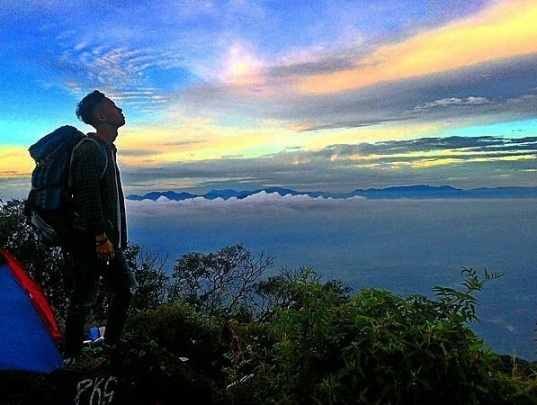 From the top of Mount Tampomas you can see the beauty of Sumedang, especially at dawn. Mount Tampomas has some archaeological sites that are a historical relic of the Padjadjaran Kingdom. In addition, the forest in Mount Tampomas has a variety of flora and fauna typical of tropical forests. You can start climbing Mount Tampomas from Narimbang Village, Conggeang. 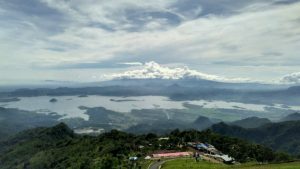 After conquering Mount Tampomas, you will be tempted to try other top mountains in Indonesia for hiking . 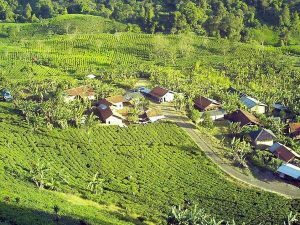 Margawindu Tea Plantation has a natural green atmosphere that is away from the hustle and bustle. The air is still fresh and its beauty is not inferior to Puncak. Along the way to the Margawindu Tea Plantation you will be entertained with the stunning natural beauty. The expanse of rice fields, hills and crystal clear river will never be bored in the eye. 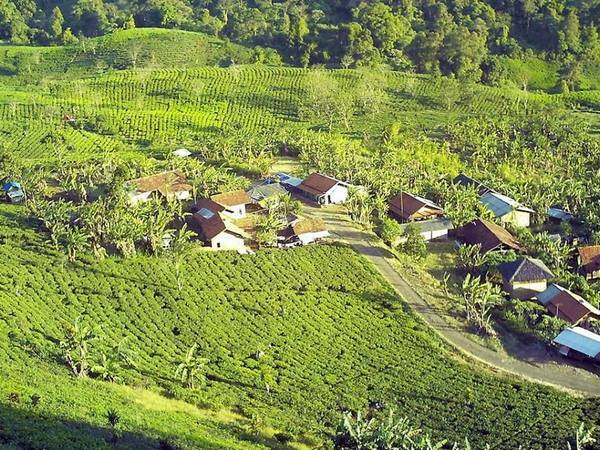 Margawindu Tea Plantation is located in Citengah Village, South Sumedang. It’s free entry. On another day you should take the time to visit Puncak’s tea plantation. Surely you have plenty things to do in Puncak. 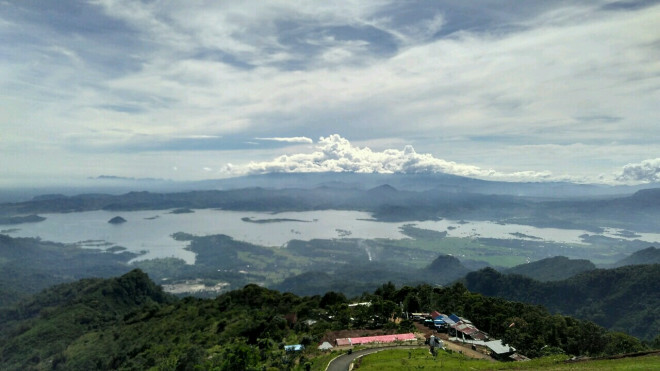 Puncak Damar Jatigede offers the natural beauty of the mountains and the charm of the Jatigede reservoir. This place is on the rise and becomes the target of nature lovers. Damar Jatigede Peak is a must visit place in Sumedang. Every day the place is crowded by tourists who want to selfie and then show it off in their social media. Puncak Damar Jatigede is located in Pakualam Village, Darmaraja. The admission is Rp 4,000. 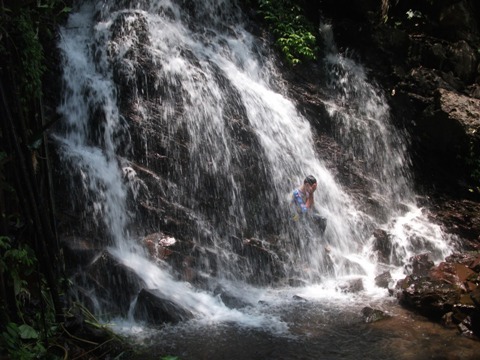 Gorobog Waterfal is one of the popular tourist attractions in Sumedang. This waterfall has a height of about 40 meters and consists of 4 levels. Gorobog Waterfall has clear and fresh water. The natural ambiance of the surrounding environment will make you feel at home linger here. Gorobog Waterfall is located in Citengah Village, South Sumedang. The admission is Rp 3,000. 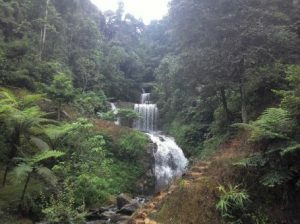 Ciputra Wangi Waterfall is situated at the foot of Mount Tampomas. The surrounding environment is still natural green, a proof of sustainability. Ciputra Wangi waterfall is in the middle of the forest. Therefore do not be surprised if you encounter with wild animals here. Ciputra Wangi Waterfall is located in Narimbang Village, Conggeang. It’s free entry. You only need to pay parking fee. Kampung Toga, which is in the mountains, has a stunning natural beauty. Kampung Toga is a perfect place to spend time with family or friends. 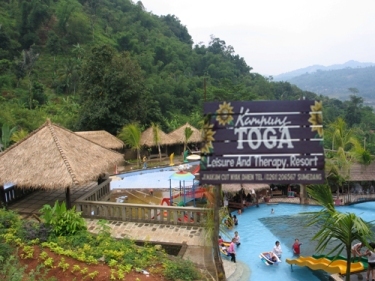 Various facilities are available in Kampung Toga such as swimming pool, waterbom, outbound area, artificial lake, fruit plantations, restaurant, meeting room, and lodging. In addition Kampung Toga is also a training center for paragliding. Kampung Toga is located in Sukajaya Village, South Sumedang. The admission is Rp 15,000. Pangjugjugan is a natural tourist attraction that is quite popular in Sumedang. Here you can see the farm of cattle, sheep, goat, catfish, rabbit and chicken. In addition, this place is planted with various kinds of vegetables and fruits. 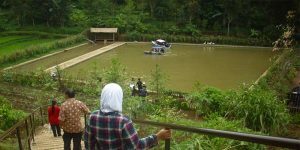 Pangjugjugan also has a natural school, outbound, children playing ground, fish therapy, swimming pool, flying fox, and fishing pool. Pangjugjugan is an affordable destination for families. Pangjugjugan is located in Cilembu Village, Pamulihan. The admission is Rp 5,000. 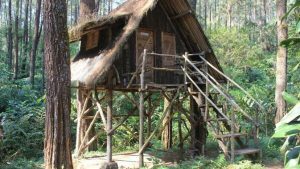 Nature tourism in Pangjugjugan is not inferior to that in Lembang Bandung. Find time to go to Bandung and you will see there are lots of things to do in Lembang Bandung. If you want to know the history of Sumedang, the Prabu Geusan Ulun Museum is the place you should go. This museum keeps the relics of the Sumedang Kingdom. 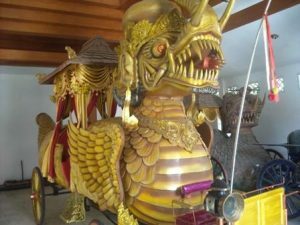 Some of the items you can see in the Prabu Geusan Ulun Museum are ancient gamelan, royal chariots, ancient cannons and king’s crown. This museum was once the residence of the ruler of Sumedang. Prabu Geusan Ulun Museum is located at Prabu Geusan Ulun Street, Regol Wetan, South Sumedang. The admission for local tourists is Rp 3,000 for adults and Rp 2,000 for children. The admission for foreign tourists is Rp 10,000. Alright guys, now you have the top things to do in Sumedang. Let’s visit Sumedang Indonesia..!